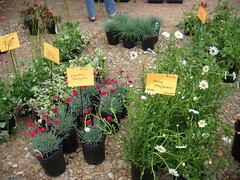 Checked out Yorktown’s “Farmers'” Market today. The quotes are because most of the vendors I saw were baked goods or other such things. There were a few meat vendors including the above seafood vendor with live softshell crabs. I saw at least one flower vendor. There was a big flat cart of produce crates but by the time I got there most were empty. Note to self: Don’t go after 10:00 a.m. It was also very bright and it made photographing stuff difficult since I couldn’t see. 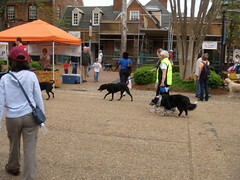 As with Williamsburg’s Farmers’ Market, there were lots of dogs. Since this market was on the river, there were also oodles of families with small children. I enjoyed the art and the rest of what the area had to offer. I hope that the next time I visit that there’ll be more produce vendors. Checked out Williamsburg Farmers Market this weekend. It’s only open about one Saturday a month still and had quite a few vendors that sold flowers. 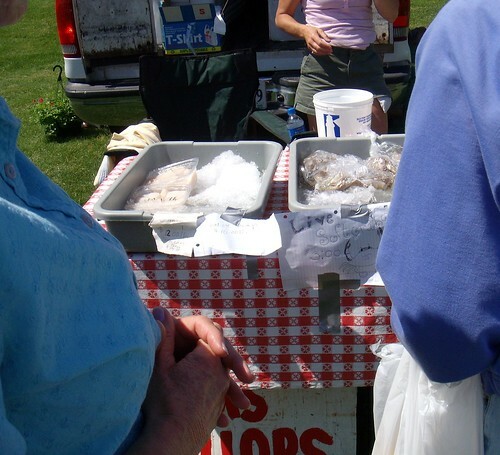 There were also sellers of fish, goat cheese, bison meat, and honey. I went there to buy some local honey. I enjoyed the multitude of dogs that were out and about with their owners. I think I saw every breed except Great Dane! I picked up a magazine called Edible Chesapeake that had some great information about what one can buy from local markets and a good list of what’s in season. I can usually tell what’s in season by the sales at the local grocery stores though. Asparagus for $1.99 a pound, anyone? I am looking forward to checking out the Yorktown Market. A lot of the same vendors that are at the Williamsburg market look like they are going to be at Yorktown so I’ll save in gas! If you’re thinking about going to a local farmer’s market, I recommend a few things. Bring cash. That way you don’t have to worry about local check and ID, or whether or not plastic is taken. Bring your own bags. And make sure it will hold what you’re buying. Bring a cooler. If you’re going to buy anything that needs refrigeration like cheese, bring a cooler or cooler bags to help keep things from spoiling. Bring your sense of adventure. One of the great things about buying from the person that grew/raised what you’re buying is that she or he is a wealth of information. Try something new! That ugly vegetable might be your new BFF. Also ask about recipe ideas.